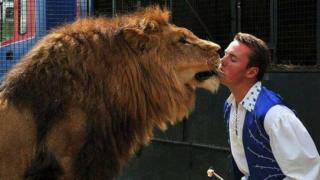 The UK's last lion tamer has been refused a licence to use three big cats in a travelling circus. Thomas Chipperfield's appeal against the decision, made by the Department for Environment, Food and Rural Affairs in July, was also dismissed in court. A Defra spokesman said it remained "absolute" in its commitment to ban wild animals in circuses. He has been keeping his animals - two lions and a tiger - in Cannock, Staffordshire. Mr Chipperfield appealed against Defra's July decision but it was upheld by North Staffordshire Magistrates Court in January. Defra said it was refused because it was not satisfied licensing conditions would be met based on Mr Chipperfield's previous conduct as an operator of a travelling circus and other relevant circumstances. Mr Chipperfield told BBC News pursuing a second appeal limited what he could say but he had "consistently acted in good faith with my team on the advice given by the circus licensing panel and their inspectors. This advice was often conflicting." A Defra spokesperson said: "[This is because] we remain absolute in our commitment to banning wild animals in circuses and intend to introduce the ban prior to the regulations expiring in January 2020. "Until we are able to achieve this, we will impose the strictest possible standards to ensure the welfare needs of these animals are met." Jan Creamer from Animal Defenders International said it was "a victory for common sense", adding that "travelling shows cannot meet animals' needs". Should wild animals perform in circus shows?